Episode 19: More in depth design details and their benefits. What is structural engineering and design? Why do I need it. WUI, Wildland Urban Interface and how it affects my home and permitting. Different structural design concepts and Mechanical Design. Plumbing, Electrical and HVAC design. Episode 20: Adding architectural design details to make the home more enjoyable and code compliant. Interesting conversation regarding building departments and how they work. Mechanical design discussion to benefit your new home project. Episode 18: How the building site affects a home’s design. Foundation types and how they benefit a home. Details to properly develop your site plan for your enjoyment and building permits. What is a grading and drainage plan? Episode 17: Proper positioning your home on your land adds to the home’s value and enjoyment. Setting the floor plan up for entertaining and family enjoyment. Can a home be “wheel chair friendly”, ADA compliant? Cathedral ceilings add to the style of the home. Episode 15: On this episode, Landmark Home and Land company president Steve Tuma reviews the company’s philosophies and methods of helping customers, and why Landmark Home and Land Company’s reputation matters. 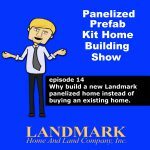 Episode 14: On today’s episode, Landmark Home and Land Company president Steve Tuma discusses why renovating a new home is much harder than building a new home, and how can you can build the home you want. Episode 13: On this episode, Landmark Home and Land Company president Steve Tuma answers Interesting questions from customers on how Landmark can help with designing and building their new home, and addresses some common fallacies regarding Panelized home building. 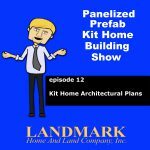 Episode 12: On this episode Steve Tuma, president of Landmark Home and Land Company, reviews questions about plans and design. How to visualize your home so you know its what you want. What is mechanical design? Why do building departments require so much information to issue a permit? What if your building department does do a plan check, meeting code regulations, and more.